That I am going to need a rotation!! I just received 2 new charts , the first is of Vin Diesel and the second is of Bella and Edward from Twilight( really gonna need a rotation for this one as it calls for 10 skeins of 939). ( I got these charts from Celtic Rose) and I also have another coming of David Draiman - the lead singer of Disturbed. They are all screaming at me. 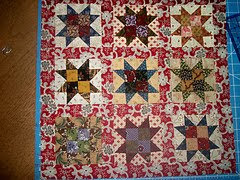 I also need to get the quilt finished too, well before Spring anyways.